SEPARATE EASTER EGG HUNT TIMES FOR AGE GROUP 2-3 Y/OLD AND AGE GROUP 4-6 Y/OLD PLEASE NOTE: Signing up for the correct time slot for each age group is important. Please arrive at least 15 minutes before your hunt to be checked in. Farm animals including sheep, rabbits, chickens, pigs, guinea hens, horses and more. Snacks & drinks available for sale. Farm shop with local produce for sale. Egg hunt and play area for children under 2 years old is free. Hayrides $5.00 per person. Children three and under are free. Children must be accompanied by an adult. What is the cutoff date for buying Easter Egg Hunt tickets?Deadline for ticket sales are final on Wednesday, April 17, 2019 at midnight. No tickets are sold at the event. 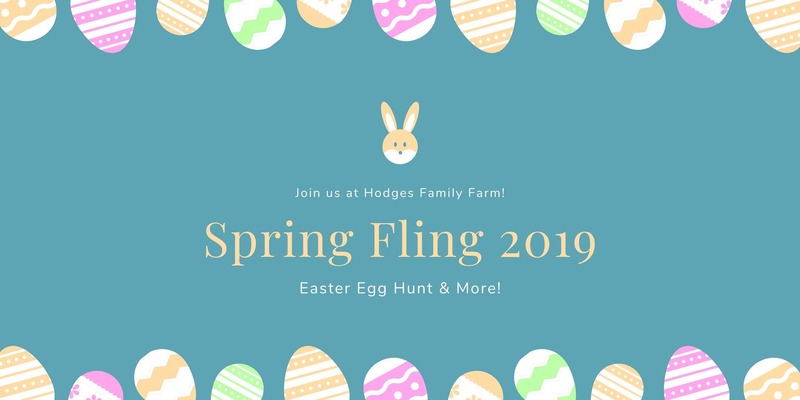 How much are tickets for Easter Egg Hunt?$5 + a $1.94 service fee for handling cost charged by Eventbrite.Please note: All tickets sales are online only through Eventbrite and non-refundable. Where do I park?Parking will be available on-site - FREE! What can I bring into the event?Please bring your own Easter basket. Are pets allowed?No pets are permitted, though service animals are welcome. Can anyone visit the farm during the Spring Fling?Of course! The Farm is open to the public during the Spring Fling. Feel free to visit, play games, and see the animals! We will have a play area set up (with eggs!) for children 2 and under. We will have hayrides available to all. The fee per person is $5. Children 3 years old and under are free. What is your refund/rain policy?All ticket sales are final. Rain dates are scheduled for Friday, April 26th and Saturday, April 27th.